September 4, 1930. Mother Louise Walz, prioress of Saint Benedict’s Convent, stood on the dock in Seattle and watched as the ferry sailing to Victoria to meet up with the ship Empress of Japan became smaller and smaller, and finally disappeared. Aboard were six sisters from Saint Benedict’s on their way to Peking (now Beijing), China, to open a women’s section of Fujen University. Benedictine monks had started the university for men; the Vatican asked our community to provide higher education for women. The community in St. Joseph prayed and discerned. It was the Great Depression and resources were scarce. The community was saddled with a nearly 2 million dollar debt on the new St. Cloud Hospital. Could they afford to take this risk? The vote to do so was affirmative and nearly unanimous. Over 100 sisters volunteered for the mission. One stipulation was made. 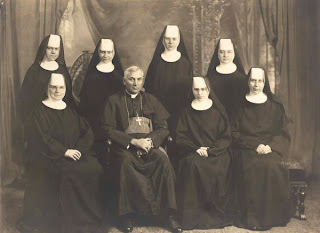 The sisters’ living expenses would be financed by the motherhouse; funding needed to open and operate the school was to be secured elsewhere. Among the six sisters chosen were four who had college teaching experience. No one could imagine what awaited these stalwart women. They would open the school to provide a college education for women. They would live through two wars, the Sino-Japanese War and World War II—educating; serving the sick and the poor; and eventually being interned in concentration camps. They would become refugees in 1948 fleeing to Formosa (now Taiwan) to escape Mao Tse Tung’s armies. The story is heart warming and heart wrenching. It will be the focus of the upcoming exhibit in Haehn Museum located on our monastery campus. The exhibit, 80 Years of Living and Working in China and Taiwan, 1930-2010 opens on March 14 and closes in late December. In future blogs I will introduce you to these amazing women and parts of their story. The seeds of their “living and working in China” have resulted in monasteries of Benedictine women in Taiwan and in Japan today. You are most welcome to come and tour the exhibit in our monastery museum.